Have you been to the top of the 108 foot tall ferris wheel for a bird’s eye view of Frisco? You have another week to experience the Frisco Fair, and then, grab your favorite wine and foodie enthusiasts because it’s finally here… the Frisco Uncorked Food and Wine Festival! All of this and more… This Week in Frisco! Ladies Who Launch: 11:30 am – 1:00 pm at Crest Infiniti. A monthly unique networking opportunity and luncheon for women in arts and business. Whether you’re an artist, businesswoman, nonprofit leader with a heart for the arts, or a lover and consumer of the arts, you’re welcome to attend! Frisco Community Blood Drive: 9:00 am – 3:00 pm at The Church of Jesus Christ of Latter-day Saints, 11000 Eldorado Pkwy. Schedule an appointment or walk-in. City Council Meeting: 6:30 pm – 9:00 pm at City Hall. Agendas are available prior to the meetings. Minutes are available following approval. You can watch City Council meetings live, as well as view videos from past meetings. HeartStories GNO: 6:30 pm – 9:30 pm at Verona Villa. Bring your circle of women for the “Gather ‘Round” HeartStories GNO where Lindsay Childress with AR Workshop Frisco will be leading a workshop to customize your very own lazy susan as a beautiful reminder to be intentional and ‘Gather ‘Round’. Use discount code LIFESTYLE to register. FISD Parent Seminar: 6:00 pm – 7:30 pm at Wester Middle School in Frisco. FISD parents are invited to learn more about self-awareness, including information about parenting in the age of social media. Frisco RoughRiders’ Opening Day: 7:05 pm at Dr Pepper Ballpark, Frisco RoughRiders vs. Midland Rockhounds. Promos: Deep Ellum Party @ The Yard and post-game fireworks. Footloose Presented by NTPA-Frisco: 7:15 pm at Willow Bend Center for Performing Arts. North Texas Performing Arts’ -Frisco brings one of the most explosive movie musicals in recent memory onto the live stage with exhilarating results! Read more about NPTA-Frisco’s youth theater program. Frisco RoughRiders: 7:05 pm at Dr Pepper Ballpark, Frisco RoughRiders vs. Midland Rockhounds. Promos: Fireworks Friday, Frisco ISD Night, and “A Tribute to Friends”. Digestive Health Make and Take w/ Essential Oils: 11:30 am at Frisco Family YMCA. This FREE interactive health class will teach you how to use essential oils to support your health and wellbeing while making your own essential oils blends. Hosted by Leann Forst, Board Certified Holistic Health Practitioner. Frisco Uncorked: 12:00 pm – 6:00 pm. Frisco’s first a food + wine festival experience that features over 20 wineries from TX and CA, delicious food from Frisco restaurants and food trucks, 3 bands, talented artists, beer and cocktails, a play area for kids and 50+ boutiques, local businesses, and shops! The festival is free and family friendly with wine and food tasting tickets available for purchase! Lifestyle Frisco is proud to be the official media sponsor of Frisco Uncorked! Listen to the Frisco Podcast to hear event organizer Lauren Stephan share ALL the details of this cool event! Footloose Presented by NTPA-Frisco: 2:15 pm at Willow Bend Center for Performing Arts. North Texas Performing Arts’ -Frisco brings one of the most explosive movie musicals in recent memory onto the live stage with exhilarating results! Read more about NPTA-Frisco’s youth theater program. Aqua Egg Hunt: 11:15 am – 2:30 pm at the Frisco Athletic Center Indoor Aquatic Center. Children 2 ½ to 10 years of age will gather toy-filled eggs, enjoy crafts, and have the opportunity to take pictures with the Easter Bunny. A mesh bag will be provided to collect the eggs in the pool, but participants should bring a basket to take their eggs home. Wear your swimsuit. Please visit the event website for specific times for various age groups. 4th Annual FearlessHope Race2Vision: 8:00 am – 12: 30 pm at the Wakeland High School track, located at 10700 Legacy Drive in Frisco. A 5K race, a timed 1 mile race, and a Laps for Little Ones, participate in the fun runs or simply purchase passes to the Family Fun Day for bounce houses, face painting, and more. Read more about FearlessHope and their mission to extend hope to children who are experiencing severe visual challenges. Music and Law Non-Profit Workshop: 10:00 am – 12:00 pm, sponsored by Frisco School of Music and Performing Arts. Calling all musicians and songwriters! Learn more about protecting your work and the music side of entertainment law with musician and lawyer Charles Wallace from Creedon LLC in Frisco. Light refreshments will be served. Register in advance. Om Well – Unlock a Better Mind and Spirit: 10:00 am – 3:00 pm. Frisco Public Library wants to help you live better. Om Well is a dedicated day of wellness featuring local experts who will teach you how to eat better, exercise, and practice mindfulness to gain peace of mind in a chaotic world. Among the featured speakers is Frisco fitness guru Jenny Dean, as well as Frisco Running Club. Trinkets to Treasures: 7:45 am – 2:00 pm at Plano Events Center. Attend the 30th anniversary of the largest resale event in Collin County benefiting the Junior League of Collin County. 22,000 square feet of merchandise – new and gently loved clothing, appliances, toys, books, bikes, sports equipment, electronics, home décor and much more! Frisco RoughRiders: 7:05 pm at Dr Pepper Ballpark, Frisco RoughRiders vs. Midland Rockhounds. Promos: Post-game fireworks and Girl Scouts Night. Footloose Presented by NTPA-Frisco: 2:15 pm and 6:15 pm showtimes at Willow Bend Center for Performing Arts. North Texas Performing Arts’ -Frisco brings one of the most explosive movie musicals in recent memory onto the live stage with exhilarating results! Read more about NPTA-Frisco’s youth theater program. Frisco RoughRiders: 4:05 pm at Dr Pepper Ballpark, Frisco RoughRiders vs. Midland Rockhounds. Promos: Kids Sunday Funday, Autism Awareness Night. 408 Macrocarpa Rd, Allen, TX, 75013: Gorgeous family home with modern accents and comfortable elegance. Wood flooring through entry, dining, and FR. Kitchen has 6 burner gas stove and high-quality granite, light cabinetry, Kitchen Aid appls, large island w sink, and breakfast bar. Kitchen nook has patio access. 13604 Stevens Point Drive, Frisco, TX, 75033: Beautiful home on large corner lot. Vaulted ceilings, arches, wood flooring and updated lighting inside. Dining room w statement chandelier is bright and open w an arched opening to family room. 14939 Foxbriar Lane, Frisco, TX, 75035: Open floor plan ready to move in! Beautiful tile flooring throughout downstairs. Dining room and handsome study off entry. Kitchen w granite, island w sink and storage, ss appls, brkfst bar, coffee bar. 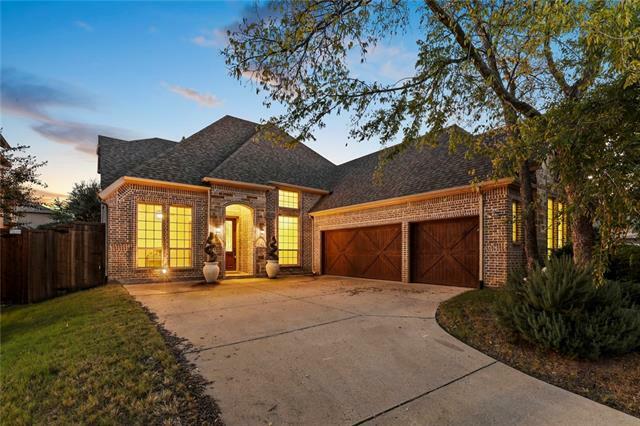 11213 Powder Horn Lane, Frisco, TX, 75033: Stunning former model home. Fresh paint, hardwood flooring, slate or decorative carpet and plantation shutters throughout. Handsome study and dining room off entry. Wine cellar w storage. Inspire Frisco: April 10, 4:30 pm Inspire Park, 6170 Research Rd, Frisco, 75033. Don’t miss the March IF TALK with Laura Beard, Founder and CEO of Sasta. With her expertise in event production, event management, training and retaining excellent help she is leveraging technology to make the hospitality industry better for everyone involved.